This Chocolate Diet from Nutritionist and neuroscientist Dr. Will Clower wants to dispel the myth that chocolate is just a “junk food”. He says learning to relax about eating chocolate can reduce your stress and actually make it easier to lose weight. In his book, Eat Chocolate, Lose Weight, Clower reveals how chocolate contains healthy antioxidants that can help you release excess pounds. The book offers a chocolate diet plan based on the latest scientific research. His clients have lost over 100 pounds while continuing to eat chocolate on a daily basis. Eat Chocolate, Lose Weight is a six-step eating plan based on the Mediterranean diet. Choose the weight loss chocolate, not the weight gain chocolate. Determine the right amount of daily chocolate. Use chocolate to lose your sweet tooth. Discover how to eat chocolate. Avoid stress-induced over-consumption of chocolate. Use chocolate to boost your workouts. Clower says we should practice chocolate eating every day. He offers chocolate eating lessons to guide you on the best way to select and eat chocolate for better health. Of course you can’t eat all the chocolate you want all the time and lose weight. These lessons will teach you how to stop the chronic consumption of chocolate that hinders your weight loss efforts. You have to train your physiology to move in a healthy direction as you choose and consume high quality chocolate. The more cocoa your chocolate has the less sugar it contains. Darker chocolate also has more health-promoting antioxidants. If you currently prefer milk or white chocolate you are going to have to learn to appreciate dark varieties. Eat Chocolate, Lose Weight says that you can train your brain over a period of 2 to 4 weeks by gradually increasing the cocoa content of your chocolate. Eating chocolate activates pleasure centers in the brain and is associated with the release of feel-good chemicals. This reduces stress hormones, which benefits your metabolism and can help you lose weight. Readers are encouraged to try eating 40 grams of high-cocoa chocolate – at least 70% – every day for 8 weeks. You shouldn’t consume it all in one sitting but rather spread it out over the day. A reduced craving for sweets. Less desire for in-between meal snacking. Better mood and feelings of well being. Weight loss of up to 20 pounds. Cocoa powder, eggs, salmon, chicken, turkey, yogurt, walnuts, almonds, bread, oatmeal, peanut butter, black beans, sweet potato, green beans, broccoli, avocado, beets, strawberries, cherries, apples, red wine, tea, coffee. Chocolate gives you more energy to exercise, reduces fatigue and helps your muscles repair after physical activity. You don’t have to be active everyday on the chocolate diet. Just get outside and find ways to get consistent movement into your daily routines. You will experience many health benefits simply by eating chocolate. But when you combine exercise with high cocoa chocolate consumption you will get an even greater boost. Eat Chocolate, Lose Weight: New Science Proves You Should Eat Chocolate Every Day retails at $25.99. Also the additional costs of high quality dark chocolate should be considered. A great list of brands to choose and avoid is here. Provides information based on scientific research about eating behavior as it relates to chocolate. The Chocolate Diet Highlights the potential health benefits of chocolate. Outlines what type and quantity of chocolate to consume for the best results. Includes two weeks of meal plans. Offers a selection of chocolate recipes. Not suitable for individuals who are sensitive to chocolate or caffeine. Eat Chocolate, Lose Weight does not offer a vegetarian meal plan. Most of the recipes include unhealthy ingredients such as white flour, white sugar and butter. Eat Chocolate, Lose Weight shows readers how to incorporate the right type and amount of chocolate into a healthy eating plan. This allows dieters to satisfy their cravings while also taking advantages of the potential health benefits of chocolate as part of a healthy chocolate diet. Not all fats are good, that’s for sure. There are both ‘good’ and ‘bad’ fats and the most important thing is to be able to differentiate between the two. As a general rule, good fats are mono-unsaturated, polyunsaturated and saturated fats. avocados which are all great for you. Good sources of saturated fats can be found in Diary and poultry. Bad fats are ‘trans fats’ (which are linked to cancer). Make sure you read the label of food and avoid anything that says “hydrogenated”. These bad fats lower your HDL (good cholesterol) and increase your LDL (bad cholesterol), they clog arteries, cause insulin resistance and contribute to diabetes. Yes, this a very true diet that works. 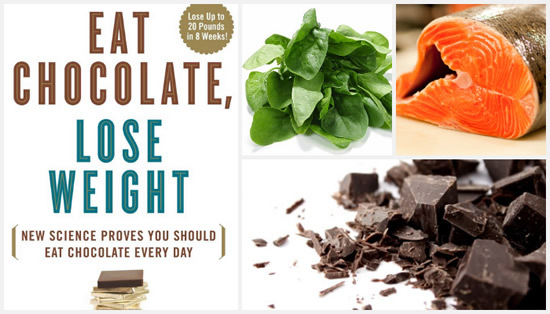 I have not read this book, but my husband and I eat dark chocolate (high quality 70 percent or higher cocoa content) all day before all meals and it curves your appitite and we eat much less during our meals. Many evenings we just have a vegtable tray with fruit and nuts with a glass (or two) of red wine. We eat a normal breakfast and lunch. I lost 15 pounds and my husband lost 21 pounds without even thinking we were on a diet. (Which we weren’t) We do exercise regularly, walking, biking or yoga classes a few times a week. But we honestly eat at least 5 to 8oz of dark chocolate every single day! I’ve tried this diet. With really hard work and watching what you eat and the right exersise, I lost a little less then what it says but close enough. I lost about 5 pounds a month. After a few months i was looking great! OMG Most of u people trying this are probably skinny! Stop the madness! Ooh!!! I’d like to try this diet!!! I think this diet could really work if you put some effort into it. All i have to say is that if you like chocolate this would be suitable for you!!!!!!!!!! while i went on this diet i gained 8 pounds wtf is up with that i thought i was supposed to lose weight not gain it. I believe this diet could really help if you put alot of effort into it as you would any other diet and I think it really is a good diet for those who are chocholic. I’m wondering if you can lose weight by eating chocolate? No, no, no! This is definitely a diet that does not work! Is this diet very good? Does it make large profits?